Stuck on the Toshiba Portege R705's magnesium alloy palmrest is a shiny sticker celebrating the company's 25 years of "laptop innovation." Now, we're the first to hate on the plethora of decals that festoon Windows laptops these days -- and this one also deserves to be peeled off and tossed into the garbage -- but the sticker actually happens to speaks volumes about why the $800 R705 is such a big deal. We promise to keep the history lesson short, but for years the Portege series has been Toshiba's top-of-the-line ultraportable brand, featuring the latest CPUs while usually setting the standard for portability, and always been attached to seriously hefty price tags. 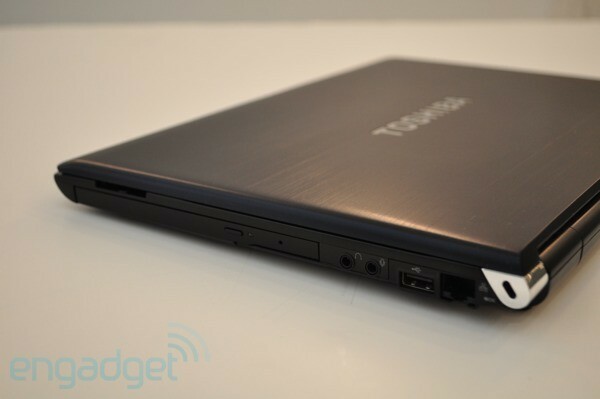 Take the Portege R500, which was the worlds lightest laptop in 2007, and cost two grand. 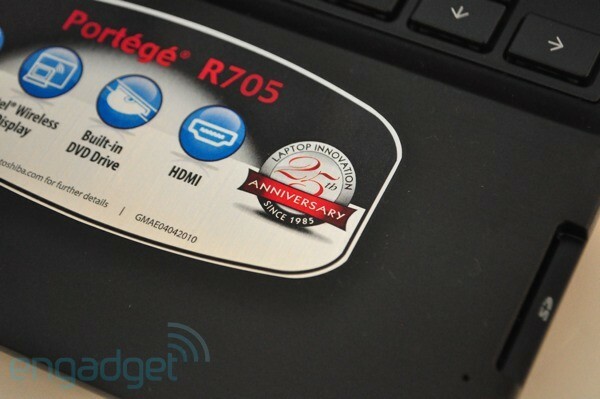 The Portege R705, which is exclusive to Best Buy for now, changes that formula. And in celebration of the big two-five, Toshiba's put out a 3.2-pound, Core i3-powered stunner that's less than half the price of past Porteges. Oh, and did we mention it has an on-board optical drive, 500GB of storage, Intel's wireless display technology and promises 8.5 hours of battery life? We won't beat around the bush -- it's impressive. But did Toshiba maintain the same Portege standards when creating the R705, or did it cut quality along with the dollar signs? That's been our main question, and we'll answer it and others after the break in our full review. How would you rate the Portege R705? The R705 looks a lot like past Porteges, and even though it'll be found on the shelves of Best Buy it still looks like a laptop for the business professional. While the dark navy colored (it looks black in some lighting) lid isn't glossy, the matte, magnesium alloy surface still picks up fingerprints and will need the occasional rubdown. The chrome screen hinges add a little something to the design, and they're also quite sturdy – unlike the Acer TimelineX 4820T, the screen doesn't wobble at all. Speaking of build quality, Toshiba's come up with a new honeycomb structure under the base and palmrest to give the entire system some added rigidly. That fear about the R705 feeling cheap quickly disappeared -- it's actually pretty remarkable how solid the system feels for its size and weight. Perhaps the R705's subdued aesthetic is Toshiba's way of not detracting attention from its insanely thin and light chassis. The system measures an inch at its thickest point and weighs an unbelievable 3.2 pounds. Carrying this machine home for the night made our 4.5-pound Macbook Pro feel like a bag of bricks. Toshiba actually claims it's the lightest 13.3-inch laptop in the world with an optical drive – and we can't seem to find any information that proves otherwise. In addition to that optical drive, the chassis also makes room for two USB ports, an USB/eSATA, Ethernet, VGA, HDMI, headphone and microphone jacks. 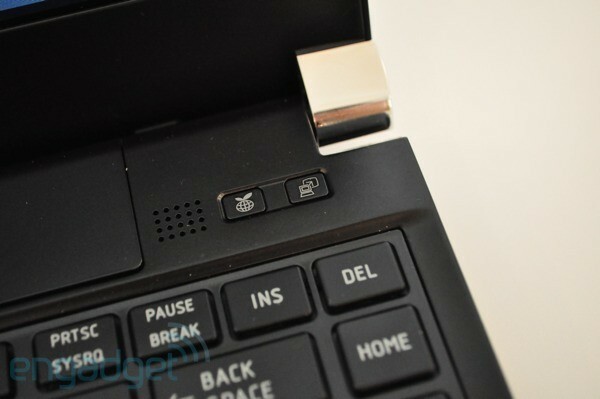 There's also an SD card reader slot built into the right side of the palmrest. 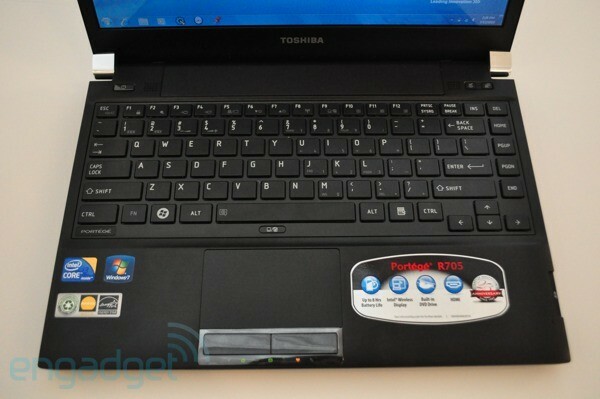 Like every other laptop we've reviewed in the last few months, the R705 has a chiclet keyboard. The black, squared-off keys are a lot like those on Toshiba's Mini NB305 netbook in terms of their Technia font, and they're similarly quite small. We're just not sure why they're shrunken – there's certainty enough space on the deck to fit larger keys -- but there's more room in between each one, so maybe that's the idea. This may end up bothering some with larger fingers, but for what it's worth, we typed this review quite comfortably. By the way, the R705 is definitely the sort of laptop you'd expect to have a backlit keyboard, but it's just not an option. Believe us, we looked for a switch more often than we'd like to mention. The plastic touchpad is decently sized and comfortable for pushing around the cursor. The pad does support multitouch gestures, and while pinch-to-zoom worked fine, two-finger scrolling failed more often than not and the right side doesn't function as a scroll strip. Yep, we were forced to scroll the entire length of Engadget the good old fashioned way. There's two dedicated left and right mouse buttons, though we wish they were raised a bit more. Usually this is where we'd spend some time criticizing Toshiba choice of a super glossy screen, but we're about to change our tune. The 13.3-inch, 1366x768-resolution display is glossy, but far less glossy than those we've seen on laptops lately -- particularly the worst offenders from Sony and Acer. We'd say it's actually got the perfect amount of gloss for a laptop like this, not to mention it's plenty bright and colors appeared quite crisp. Still, the viewing angles are disappointing. We could see the screen while sitting to the side of it, but tilting it caused colors to distort. The two small speakers above the keyboard were tinny, but were fine for sharing the reaction to a double complete rainbow on YouTube with a friend sitting close by. We really didn't end up watching much video on the 13.3-inch display itself since the R705 boasts Intel's Wireless Display technology, otherwise known as WiDi. Unlike the Toshiba Satellite E205, it doesn't come with the $100 Netgear Push2TV, which is the other key ingredient needed to wirelessly beam video to the big screen. It's a bummer that the box isn't included, but if you do happen to hook your computer up to your TV to watch videos or listen to music we'd recommend adding it at checkout. As we mentioned in our review of the E205, the whole thing couldn't be easier to set up. There's still a two second delay on the TV, but it doesn't make much difference if you're just watching some video. In addition, with the recent WiDi firmware update, you can extend the desktop – we actually wrote most of this review on the laptop screen while iTunes was open on our 40-inch HDTV. We'll get to the graphics in a bit, but a streaming episode of Mad Men and a local 1080p file played smoothly on the big screen. Performance-wise, the R705 was very comparable to the number of Core i3 laptops we've reviewed lately. Actually, just like the Acer TimelineX 4820T and the Sony EC Series, it's configured with a 2.26GHz Core i3-350M and 4GB of RAM. It kept up with our everyday routine of writing in Microsoft Word, checking our Twitter feed in TweetDeck, surfing the web in Firefox, and chatting through Trillian. Watching a DVD with those programs open in the background was also a breeze. For those that demand more power, the Toshiba R700 has the same chassis, but will be configurable on Toshiba's site with Core i5 / i7 CPUs as well as with solid state drive options. Our unit had a 500GB hard drive with Windows 7 Home Premium. The hard drive accelerometer is a nice safety addition, but it's rather sensitive, so you'll probably want to disable the alerts. The R705 relies on Intel's integrated HD graphics, and though we've been thinking the machine would be a perfect candidate for NVIDIA's Optimus, unfortunately for now we've yet to see any laptops with the two technologies (though, NVIDIA claims they can live in harmony). Regardless, the integrated option was fine for playing back high-def YouTube videos and regular flash video on Hulu and Amazon, but it won't satisfy those that want to play some high resolution games. One of our major – and frankly one of our only -- concerns about the R705 has to do with its warm temperatures. Toshiba has worked on a new Airflow cooling technology that pulls fresh air from the fan on the bottom left of the system, and then directs the warm air out the left vent. It's a cool idea (oh yes, pun intended), but the left edge of the laptop does become incredibly warm during CPU-intensive tasks like playing Flash content -- and when we watched an episode of Mad Men the bottom of the system became quite warm as well. We'd say the heat on the R705 was worse than that on the TimelineX 4820T, actually. However, during our normal everyday usage -- surfing the web, chatting, listening to music -- we weren't bothered by the heat even when we had the machine on our lap. Toshiba's promised 8.5 hours of battery life seemed quite unrealistic to us, and in reality it was actually about half of that. The R750's 66Wh six-cell battery lasted four hours and 25 minutes on our video rundown test, which loops the same standard definition video with screen brightness set at 65 percent. That's very comparable to the TimelineX 4820T, and in our everyday use with WiFi on and brightness at 85 percent we squeezed about five hours out. It's a decent runtime, but it's not going to last the flight from New York to London. It was a relief to boot up the R705 and find the desktop virtually spot free – the little Recycle Bin icon in the top left corner was no bother. However, Toshiba still loads up the ultraportable with some added software, including its Bulletin Board and webcam programs. Also, because the system is a special to Best Buy, it comes with Best Buy's own software installer. Blech. 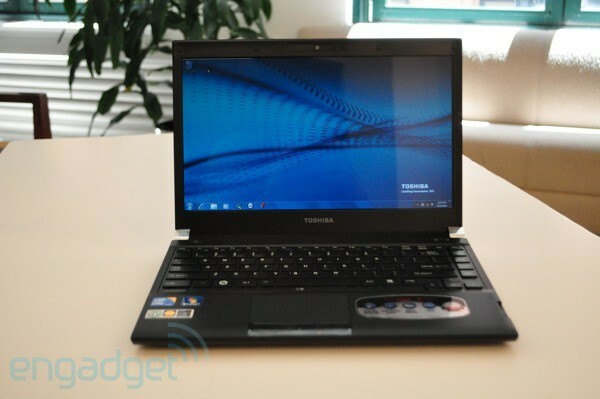 Remind us to thank Toshiba for celebrating its 25th year in the laptop business with the R705. Despite some heat issues, the $800 Portege R705 was simply impressive. Flat out, consumers haven't been able to get such a feature-packed ultraportable at such an affordable price until now, and the cheaper price tag doesn't result in a shoddy build as we expected it might. If you're looking for a thin and light 13-inch laptop under $900, the R705 beats all the others on the market – and that's not something we say often. Hey, Toshiba, how do you feel about celebrating every birthday this way?